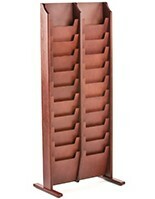 Traditional Look is Eye Catching! 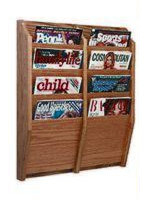 Tons of Slots for Storage! 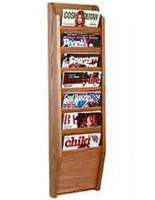 This 10-pocket commercial booklet rack that is a publications center is wall mounted for a secure and stable presentation. 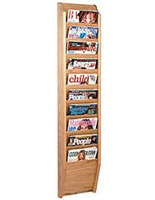 Display all manner of company literature without taking space up on the floor or on a desktop! 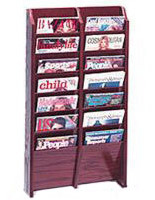 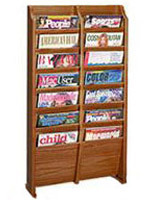 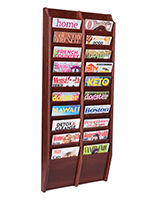 This 10-pocket comemrcial booklet rack, periodical holder, accommodates glossy catalogs, newspapers, and other letter-sized offerings in an organized fashion. 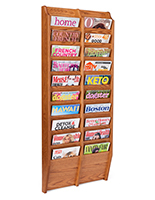 This wooden display rack has ten dividers in which to store promotional materials or files for a business. 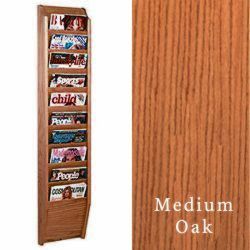 This commercial booklet rack that is an oak fixture allows ten groupings of materials, which means the selection can be vast, and diverse!